With the South Island built out from the spiny backbone of the Southern Alps, and the North Island strung around a volcanic core of mountains, there are literally hundreds of kilometres of alpine country to be explored in New Zealand. And given that it is a relatively small country, much of this back-country is within a day's drive, or less, from significant towns and cities. And many of these places also have very comfortable accommodation nearby as well. Summer is the time to enjoy hiking in the back-country, with warm days and comfortable nights. In winter the true high country is under snow all or part of the time. Having said that there are plenty of hikes that stay just below the snow line and can be walked any time of year. Helicopter access is a great way to access high and beautiful places without the multi-day walks often required. If your itinerary doesn't allow time for long hikes then consider hili-hiking. We can source heli-access throughout the country. The other big activities in alpine areas are skiing, snow-boarding and heli-skiing. There are ski areas through much of the South Island, and on two mountains in the North Island, with the season generally running from around June to September. Lots of people travel to Queenstown for the Winter Festival in late June/early July. This is a busy week of on-snow and off-snow mayhem and celebration - so choose to join it or avoid it! Below is a summary of some of the great places in New Zealand to enjoy the alpine environment - email us for more info. Queenstown is part of the alpine scene in New Zealand. This busy resort town sits on the shore of Lake Wakatipu and is surrounded by high mountain ranges in every direction. If you fly in to Queenstown you'll get a fabulous view of these mountains as the plane weaves its way down to the runway. There is excellent high country hiking from here, and the two main ski areas are on Coronet Peak and the Remarkables Range. The Cardrona ski area and Snow Farm lies half way between Queenstown and Wanaka, another beautiful resort town. Wanaka is much smaller than Queenstown and has its own perfect lake, Lake Wanaka. Also surrounded by high peaks and ranges Wanaka is close to the Cardrona ski and snowboard facilities, and also Treble Cone ski area, on the far side of the lake. Heli-skiing is an excellent option from both Queenstown and Wanaka resorts and lodges and will get you to some of the best skiing on offer in New Zealand. Ask us for more info. The Tongariro National Park sits in the very centre of the North Island and is home to three of the island's highest mountains - Ruapehu, Tongariro and Ngaruohoe. All are active, though reasonably quiet, volcanoes, and each plays a major role in Maori stories of the land. It s also a noted World Heritage Area. The Tongariro Alpine Crossing is a rugged day walk covering 19 kilometres of alpine country and is walked by a large number of people each year. It is best done from the western Maungetopoto end and local advice is required as this walk is deceptively demanding. There are several other multi-day hikes and numerous short walks in the area. Mt Taranaki, on the West Coast of the North Island is also a serious mountain area with a ski field and a number of hiking tracks. Mt Taranaki is best accessed from the New Plymouth area. 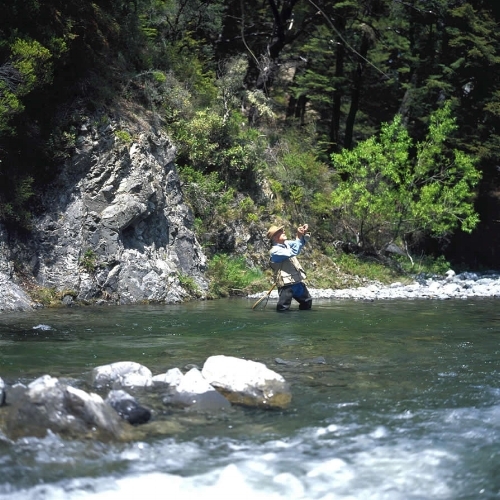 Just a 90 minute drive out of Christchurch the Canterbury high country is easily accessed from the city and nearby lodges. Head south and west through Geraldine and on to Lake Tekapo and the Aoraki-Mount Cook National Park for access to a fabulous area of high peaks, glaciers and turquoise lakes. 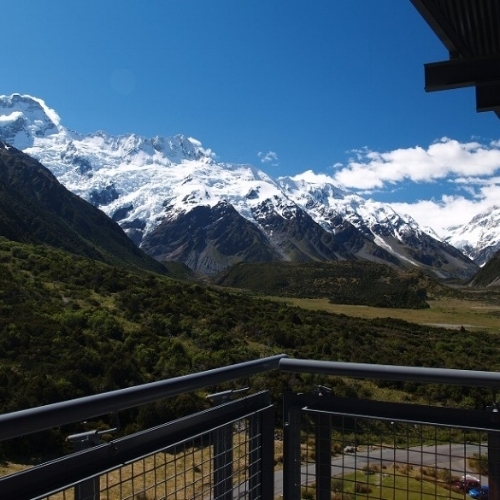 Aoraki-Mt Cook is the highest mountain in New Zealand and translates as the Cloud Piercer. Mountains in this area are serious climbs that require experience and/or guides. Helicopters will take you on to the glacier, or higher to hili-ski or heli-hike. Small planes also provide sightseeing flights and there are excellent short and longer hikes around the lower elevations the mountains. If you head due west from Christchurch towards the West Coast 90 minutes will again get you to Arthurs Pass and the main crossing of the Southern Alps. This area is very accessible for hiking, kayaking, mountaineering, nature tours and fly fishing (in season). Fiordland National Park is part of the much larger Te Wahipounamu World Heritage Area, and includes vast areas of lofty peaks, deep river valleys and fiords, and isolated beaches. It literally rises from the sea to the sky. In winter the tops of this beautiful area are under snow but you can still experience the lower levels by hiking the fabulous hiking trails like the Milford, Kepler and Routeburn Tracks. There are also shorter walks to alpine lakes and through beautiful native forest. In summer, when the snow has melted, the higher regions are more accessible, but this country demands experience and/or the use of guides as it is serious wilderness country. As with most of the alpine areas in New Zealand, helicopter or small plane scenic flights give easy and quick access to the most remote places in a short time. We recommend this if you are on a short time frame or just prefer not to do a long walk. There is only one road in to the Fiordland National Park, which runs from Te Anau to Milford. There are also day trips available from Queenstown.